Maricella "Chella" McDonough has a secret, one that's been eating at her for her entire adult life. Her husband Tom is none the wiser, nor are their two grown sons Jóse and Mike. But it's time for the secret to come out--prodded into the open by the body of a young woman that mysteriously ends up on Chella's property. A body linked to her past. 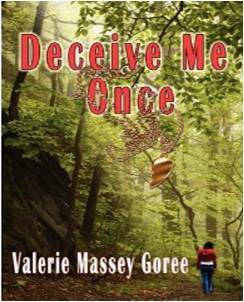 So begins a tale of intrigue and suspense, aptly entitled Deceive Me Once, for, indeed, once is all it takes. Once to bare one's soul, once to risk one's life and once to seek forgiveness. Ms. Goree sets her story in the Hill Country of south-central Texas, not far from San Antonio. The land is rugged, in its own way beautiful, and often unforgiving. So is the tale she tells. When Chella embarks on a covert mission to uncover the mystery surrounding a half-heart necklace found on the girl's body, more than solving a crime is at stake. She forces herself back in time to a horrific event she not only witnessed, but believes she caused: the death of her parents and the destruction of life she knew as a teenager. Aided by her godly and faithful daughter-in-law Teresa, Chella begins step by step to unravel the true circumstances surrounding the childhood tragedy and begins healing those wounds self inflicted so long ago. But there's more to Ms. Goree's story. As is so true with deceit, Chella is not the only one affected by it. Her unconfessed sin has created a rift in the areas that matter the most: her marriage, her family and her faith. The question is whether she can untangle herself from the spiritual-emotional tentacles that have embedded themselves in her mind and her heart over the past 25 years. The answer to that question does not lie in this review, it lies between the covers of Deceive Me Once. Look there for it. You'll be glad you did.